Registration is free. All you need is a valid email address. New Game Create a new game and join us! 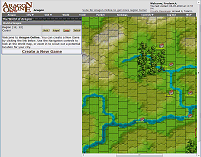 Aragon Online is an interactive, empire-building medieval fantasy game that blends economics, diplomacy, trade, role-playing and tactical battles into a strategic multiplayer online experience unlike any other out there. It is a world of PCs and NPCs, potentially dangerous or advantageous politically, economically and militarily. Player interaction can be adversarial or cooperative. 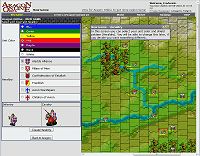 The war-game battle system has standard battle elements and fantasy-style magic. The system emphasizes combined-arms battles, and will appeal to serious fantasy (war) gamers. 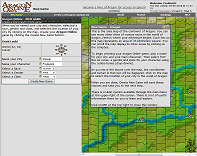 The player character takes the role of the ruler of a small village in a vast world. There are 6 player races (Human, Elf, Dwarf, Orc, Goblin, Ogre) and 5 classes (Warrior, Knight, Ranger, Priest and Mage) that the player can choose to be. He starts out with a follower character (henchman) and a small army of 75 soldiers chosen from 5 unit types (Infantry, Mtd. Infantry, Cavalry, Bowmen, Mtd. Bowmen). Each of the cities vies with the others to attempt to increase their power and influence in the world through Diplomacy, Intrigue and Battle. 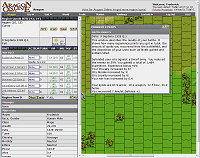 The role-playing aspects of the game are implemented with a script system that presents messages to the player, and sometimes presents him with choices that will lead to other messages and consequences good or bad, depending on many possible factors. Aragon Online was conceived in 2003, and has been in active development for the past 8 years. It is now open for a public beta-test. In order to play Aragon Online, you must be a registered user of the Aragon Online forums. You will be redirected to the forums to register if you are not logged on, or if you are a new user. Once registered, on your first visit to Aragon Online, you will be redirected to the New Game creation screen. The screen displays the World Map, with navigation controls to move around the World Map. You may establish your new City anywhere on this map, except in water hexes, or where there is already another city or special location. The developers of Aragon Online hope you enjoy this unique game, and wish you the best of luck in your adventures! In the input fields and drop-downs on this page you will name your character, select a gender, race and class, and name your starting city. Select a color and shield that will define how your units look. The heraldry selection you make can lead to some special adventures specific to that choice later in the game.